If you were injured in a motorcycle accident in Kendall, it’s wise to consult the best Miami motorcycle accident lawyer you can call to help you determine if you are entitled to a damages recovery. You may have heard about people who handle these issues themselves, but you should know that they often don’t have as much success in getting the compensation they deserve as those who get legal advice from an experienced lawyer. Our Kendall motorcycle accident lawyers at the Wolfson Law Firm have more than seven decades of experience collectively in helping those injured in motorcycle accidents in Miami. Our consultations are free and confidential, and you won’t pay any fees until we recover for you. You can reach us anytime at 305-285-1115. The history of the neighborhood of Kendall began in the late 19th century, when the Florida Land and Mortgage Company bought the land of what is now this area from the State of Florida. The early establishment got its name after John Broughton Kendall, the director of the company. The area had been developing very well until hurricane Andrew destroyed much of it, making many residents to move. However, Kendall kept developing and now is a thriving neighborhood of 75,000 residents, a majority of which are Hispanic or Latino Americans. Kendall is currently in the top 7% in the US by public transportation use, yet the traffic can be hectic and lead to many accidents, including those with motorcycles involved. Also, Kendall is in the top 15% in the US for median family income, well-paid single women, college-educated adults, and racial diversity. This area is a part of the Miami metropolitan area. 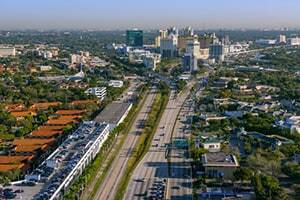 It is surrounded by many communities and neighborhoods, including West Kendall, The Falls, Pinecrest, Sunset, The Hammocks, Palmetto Estates, South Miami, Richmond Heights, Country Walk, The Crossings, Three Lakes, Kendall Lakes, and Glenvar Heights. If you or your loved ones have been injured in a motorcycle accident in Kendall, you’ll need good legal advice. You may be able to claim damages for your medical and non-medical expenses and losses, including medical bills, scarring, disfigurement, pain and suffering, lost earnings, and permanent disability. Motorcycle drivers lack the protection that the chassis gives to a car, hence these accidents can end with more traumatic consequences. If you’ve been ill-fated to suffer in such a terrible event, give us a call. Our Kendall motorcycle accidents attorneys at the Wolfson Law Firm have been helping people who have been injured or lost loved ones due to motorcycle accidents throughout South Florida and the Florida Keys since 1963. Contact us at 305-285-1115 for free and confidential consultations.